Like most Americans, soccer is something that I tend to care about once every 4 years. However, soccer’s popularity has been growing leaps and bounds over the last decade or so. Despite Major League Soccer’s recent import of talent, most everyone knows that the best soccer in the world is played in Europe. Before cable networks started carrying the Fox Soccer Channel one of the only ways to watch the world’s best talent was to head out to certain bars, sometimes very early in the morning, sometimes in middle of the afternoon. 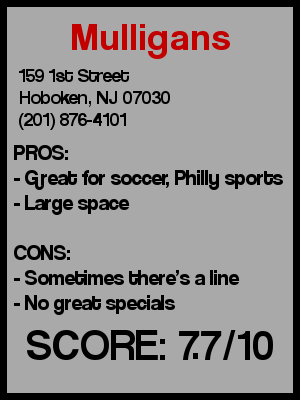 Catering to the soccer hooligans needs is Mulligan’s, one of New Jersey’s premier soccer bars. Mulligan’s, located on First Street between Garden Street and Bloomfield Street, because of its soccer (they call it football) motif, stands out from the other Irish bars on the block. As we walked in already a little tipsy from pregaming at other bars, we headed straight to a large circular table near the computerized jukebox. There were only about 20 patrons at the bar when we walked in (around 7:30pm), but being empty is understandable since we were definitely early for the night crowd. The place is pretty big with a long bar running nearly the entire depth of the main room. There is a separate long room behind the bar which is great for renting out for parties, and a separate little alcove with a pool table. The bathroom is down the stairs and even that is decorated for soccer with a little ball/soccer net contraption in the urinal for your streaming pleasure. Soccer memorabilia lined the walls; it was also shown on the televisions, and for a while the soccer loving crowds were even able to sustain a soccer store that just recently went out of business next door. Besides soccer, this fun Irish bar is also a Philadelphia Eagles and Phillies bar…so you won’t see me stopping by on Sundays in the fall. But overall they get a good crowd there on most nights. The bartender was friendly, and it seemed that they had a few regulars. And although it was early, there was a group of inebriated cougars that were trying to make conversation with me when I came back to the bar to pay my tab. I inexplicably (for the first time ever) left a bar with my credit card behind the bar holding a tab. Luckily when I went to open up a tab at the next place I quickly realized the error of my ways, and returned to pick up my card seamlessly. Preconceived notion – I’ve been there before and it’s been crowded, almost to the point of there being a line. Also last time I was there, over 50% of the people had mustaches…but that’s because they were having a mustache party. Either way I was expecting a lively crowd. Catch up with a friend – Great place for this! First or last drink of the night – I think that regardless of day or time, there will be someone in this place ready to strike up a conversation with you. Overall – In a city with a ton of Irish Bars, this bar stands out for its affiliation with Philadelphia sports teams and football (there I said it…instead of soccer that time…but now its gotten everyone all confused). It was one of the bigger bars in Hoboken until the new set of bars (1-Republik, Village Pourhouse, etc) opened up, but always has maintained a neighborhood feel despite being big. It’s a friendly place and one with a lot of repeat customers… and I wouldn’t mind visiting again either. I’ll give it a 7.7.